It’s not often that the text of a legislative bill is shorter than its own explanatory statement. But such is the case for a bill offered by a group of House Republicans last week. House File 312, offered last Tuesday by state Reps. Sandy Salmon (R-Janesville), Ralph Watts (R-Adel), Dean Fisher (R-Garwin), Steven Holt (R-Denison), Greg Heartsill (R-Melcher-Dallas), Larry Sheets (R-Moulton), Tedd Gassman (R-Scarville), John Landon (R-Ankeny), John Wills (R-Spirit Lake), and John Kooiker (R-Boyden), relates to the use of statewide assessments approved by the Iowa Board of Education in Iowa’s school districts and accredited non-public schools. 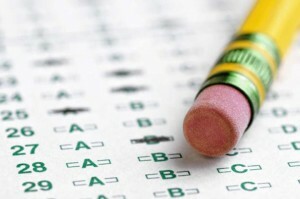 The Iowa Assessments, formerly known as the Iowa Test of Basic Skills and the Iowa Test of Educational Development, have been used for decades by Iowa schools to assess the educational progress of students. Since the 2011-12 school year, they have been used by the Iowa Department of Education for annual federal progress reporting purposes. HF 312 would prohibit the Iowa Board of Education and the Department of Education from “adopting, administering, or approving the administration of assessments developed by the Smarter Balanced Assessment Consortium.” The SBAC is a state-led consortium working collaboratively to develop assessments aligned to the Common Core State Standards. The proposed legislation would also strike a current provision of Iowa Code that directs the Iowa Board of Education’s rules must require all students enrolled in grades 3-11 be administered an assessment in the final quarter of the school year. State law currently requires those tests must “assess the core academic indicators,” is “aligned with the Iowa Common Core Standards in both content and rigor,” and several other requirements. HF 312 also strikes a provision of Iowa Code that establishes an assessment task force to review and make recommendations for a “statewide assessment of student progress on the core academic indicators.” It is supported by Concerned Women For America of Iowa, while the Iowa State Education Association, the Iowa Department of Education, the Area Education Agencies of Iowa, and the Iowa Association of School Boards are opposed to its passage. The Iowa Board of Regents, the Greater Des Moines Partnership, and the Iowa Chamber Alliance have all declared they are “undecided” on the proposed legislation.